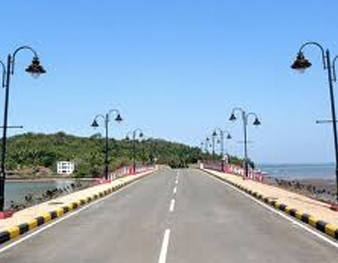 During monsoons, water used to overflow over the causeway thus causing inconvenience to locals. Also, the waterway was blocked due to the existing pipes in order to restore the sea fauna life. This was until the Jacinto Island bridge was constrcuted. The bridge connects the beautiful island of St. Jacinto to the mainland. Total length of bridge – 96 m with approaches of 90 m on either side. Width of bridge – 12.5 m including footpaths. 6 spans 16 m each continuous solid slab superstructure with footpaths on either side. Two lane bridge with footpaths on either sides. Superstructure to directly rest on pile caps. Substructure to comprise of bearing pedestals, pile caps and piles. Bridge with proposed approaches has parabolic profile in elevation. Mural of china mosaic work, designed by Goa College of Arts, has been carried out on the crash barriers on the footpath side. Construction of Bus Stand at Honda. Construction of Bus Stand at Canacona, Goa.